Southern In Law: I am IRON WOMAN! Hi sweet peas! I'm unhooked and out of the hospital and I've just devoured a chocolate protein breakfast bake. I am currently iron woman as I have one helluvalot of iron flowing through my veins! Dare I say it, I actually feel quite a lot better today after my iron infusion. I'm very achey, but I feel like my head is clearer and the colour is coming back in my skin. I'm not so yellow or crazy pale. I'm taking each day as it comes because I know there's a chance I will feel a bit worse before I get better. That picture above? That's my holymoleyI'mreallyterrifiedmumthisisn'tagoodtimeforapicture face. They'd just put the IV in and I'd just gotten over this weird fainting spell that I had when they did it. Usually I feel faint after they've taken a million vials of blood, but for some reason when they put the IV in, my blood pressure crashed and I was super woozy. This was my challenger for the day. The challenge took place in the Oncology unit of the hospital (so basically the chemotherapy room) and looks can be deceiving, because that small bag was totally evil. It contained ONE GRAM of iron. Sounds puny, right? It's actually a huge amount for the body to take in. The only other person in the room having iron was an old man, and he only had 500mg. My doctor seemingly forgot to tell me about the fact that the iron I was receiving hurts.... a lot. It was a constant ache with random pains for over six hours. 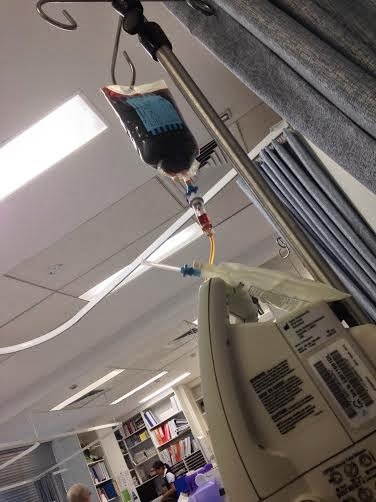 As soon as the iron started dripping into my veins, it started - and it didn't stop until the saline flush started to run clear. I thought it might have just been the IV, but when the nurse asked me if the pain had stopped and then pointed out that it was also running clear, we confirmed it was definitely the iron. Luckily, they found me a heat pack which helped with the achey pains for a while - but the iron was also making me have random hot flushes (I was hot from the neck up, cold from the neck down) so it was driving me nuts to have all these different temperatures going on. Six hours is a crazy amount of time to be sitting in a chair. Especially a chair that's too small to accommodate your extra long legs so you have to sit in a weird crunched up position that makes your hips ache. And it was a very busy day in the oncology unit. 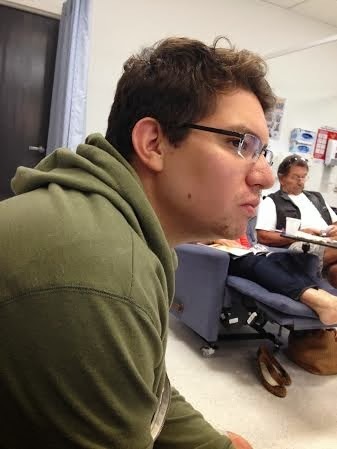 Every chair was booked up and it was a scurry of nurses feet, constant beeping, blood pressure checking and noise. I tried to read a book, but the iron also made me really tired and a little bit spacey so I couldn't concentrate. In fact, this guy walked into the room and I was so spacey it took me a few minutes to realise it was him! And then I proceeded to ask him about his day.... and re ask him 5 minutes later when I'd forgotten what he said. Sorry babe. By the time I was about 4-5 hours in, I started going stir crazy and watched that time remaining thing tick down, trying to hold onto my sanity. I just wanted to go home, I was aching and tired and wanting my puppy and my bed. I think the poor nurses felt evil when the IV finally started buzzing and beeping to be unhooked and there was still iron in the bag. 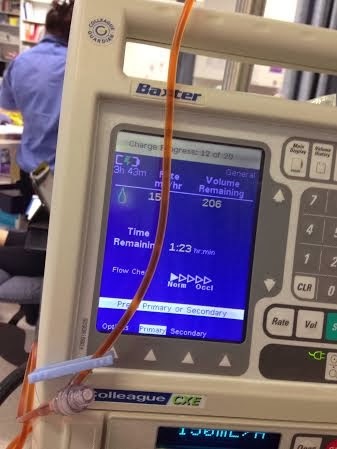 "Sorry sweetheart - 8 more minutes, just 20mls I think" I looked at the bag and there was a wholeeeeeeeeeee lot more than 20mls - and my suspicions were confirmed again when the IV started beeping once more. 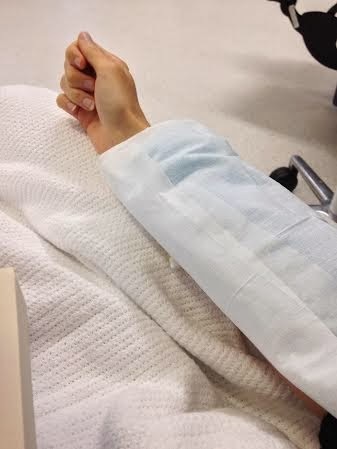 "Sorry Kristy, another 8 minutes and then you should be done... just 20mls" a different nurse, but dejavu. 8 minutes was up and Lucy told me the best news ever! "And you're done! Well... almost, just a flush left - but I promise you it's only going to take 10 minutes. You just need 30 mls". The teensy wincey oh so comforting bag of fluid went up and it perhaps made me the most impatient I'd been the whole day. 10 minutes were up, and they set me freeeeeeeeeeeeee! 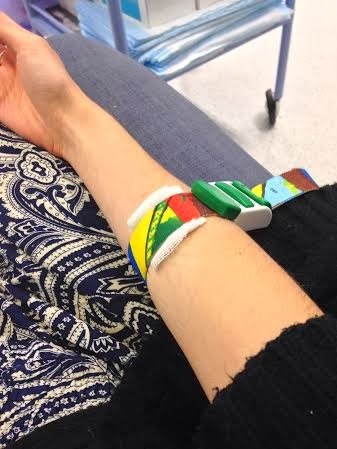 I hadn't had an IV since I was 7 years old - and that was a bit of a traumatic experience as I'd been absolutely terrified of needles and had to be held down by my Mum - so I didn't really know what to expect. Seeing as Jesse had been in hospital last year, I asked him what it felt like when they take it out and he said "It hurts way more than when it goes in" so I was preparing myself for pain (even though when they put it in, I didn't feel a thing - I was too busy praying that she got it in the first time, unlike the 4 other patients I'd seen her miss before me - and she got it first time!). After I sat for a while with the tourniquet putting pressure on my arm, I was free to go! We headed home and I cooked Jesse dinner (because I'd forgotten about making him something in advance) and pulled out some Sweet Potato and Feta Frittatas for dinner for myself. I was sore, achey, headachey and tired and in bed by 8pm - and I slept right through until Jesse's alarm went off at 7am. Unheard of for me! Like I said earlier, I do feel much better today - despite the aching. I'm hoping it's onwards and upwards from here - but I'm also prepared that I may feel a bit worse before feeling better. I'm still uber hopeful that this was the fix I needed though! But tell me, how do you deal with needles and IVs? I'm a bit of a chicken, but I am way better now than I was a few years ago as I've had so many needles and blood tests. The IV was actually really easy - the only issue was the aching pain from the iron. And what are your weekend plans? For me it's relaxing. I was told to take it easy this weekend and the wet rainy miserable weather agrees. I think today will be a day of movies and relaxation and then tomorrow we have church - two services, our regular service at 10am and our Discipleship Explored course at 5pm! I would have been pissed and ordering everyone around, haha! I know when I get my blood taken I always start laughing. It is that weird tickling pain, you know? Hi Kristy. I'm a new follower :) Sorry to hear about your long day. I'm glad you made it through! Glad it's all over for you, Kristy!! Sounds like a long and miserable day, and I'm happy you can rest and refocus now! awww you are such a brave girl, friend! Eeeeek the thought of iron going into my blood really scares me for some reason. I hope you have a beautiful day and hang in there. Much love! Oh don't worry, it did the same for me - I had to kind of mentally separate myself and the iron, because when I thought about that yucky red brown stuff going through my body is skeeved me out! I usually don't like taking any medications as I'm prone to bad reactions so it was totally odd for me! 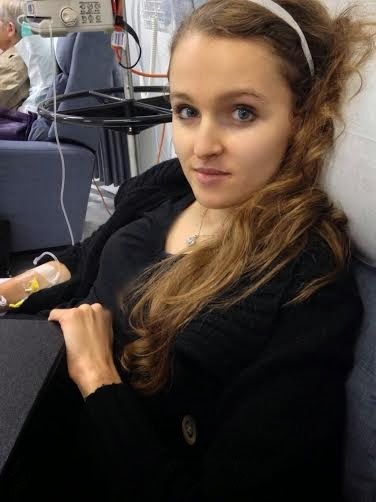 I just had my first iron infusion late last year after 30 injections had failed to do the job. Now, three months later (and even after an emergency gallbladder removal) my iron is still way high! 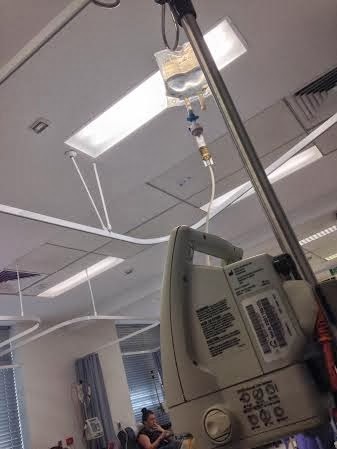 I had 1.1g injected over the course of 8 hours, and thank goodness my hospital had Foxtel and comfy chemo chairs because I was going c-r-a-z-y by about two hours in! I hope that your outcome is as good as mine was. My specialist said last week that I probably won't have to have another one if my blood manages to hold onto the iron this time. Thanks for sharing your experience :) Makes me feel better to know I'm not alone out here! Amy, you're definitely not alone! I am so glad the iron infusion worked for you! How long did it take for you to feel like there was a difference? I had my infusion 3 weeks ago and I'm only just now feeling like I'm leveling out - I had a week of being absolutely ill, then a week of incredible energy, then a week of no energy and now I feel like I'm in between. It took me nearly a month to feel like everything was working properly. Now I feel like I can actually breathe again! I hope your energy picks up again - although this weird end of summer weather can't be helping! Oh that's good to know!! Thank you!